LSU running back Leonard Fournette is leading the Heisman Trophy race halfway through the season. It’s mid-October, so you know what that means: It’s time to hand out some Heisman Trophy hardware. Wait, October? The Heisman Trust doesn’t announce the winner of the trophy until December. That’s true, but somehow we’ve already reached the halfway point of the college football season. It’s time to unveil the winner of this year’s Halfway Heisman, which goes to the country’s best player through seven weeks of football. The Watchman feels it’s necessary to offer a disclaimer: Just because a player wins a Halfway Heisman does not mean he’ll win the real award. But the midway point of the season is a perfect time to reset the Heisman conversation by honoring the leader in the race, as well as a few other players. LSU’s sophomore has been the most dominant player in the country, and thus he wins the most sought-after imaginary award in college football. On Saturday, in a 35-28 win over Florida, Fournette delivered against his toughest opponent yet by rushing a career-high 31 times for 180 yards and two touchdowns. The running back now has at least two touchdowns in five of the Tigers’ first six games this season. Only one running back—Alabama’s Mark Ingram (2009)—has won the Heisman in the last 15 years, but Fournette’s first-half performance has exceeded expectations for run-first Heisman contenders. The Tigers’ star ranks first nationally with 1,202 rushing yards, the eighth-most of any player through six games in FBS history. Fournette paces the country with a 200 yard-per-game average, sits tied with Houston’s Greg Ward Jr. for the national lead in rushing touchdowns (14) and averages 8.01 yards per carry. The future could be even brighter for Fournette if quarterback Brandon Harris continues his recent surge. Harris, who was a virtual non-factor through the first few weeks of LSU’s schedule, has thrown for more than 200 yards in his last two games. Harris could force defenses to respect LSU’s passing game instead of loading the box against Fournette. If that happens, Fournette could snap the recent quarterback-heavy Heisman era. Boykin was a preseason Heisman contender who has maintained steady but dominant performance all season. Perhaps his most impactful outing came on Saturday, when he reeled off 510 yards of offense with five total touchdowns in the Horned Frogs’ 45-21 win over Iowa State. Boykin completed 84 percent of his throws (27 of 32), the best mark of his career and the fourth-best single-game percentage in TCU history. Running backs have largely dominated the Heisman conversation in 2015, but Boykin has positioned himself as one of the most viable quarterbacks through six weeks. He’s the headliner in TCU’s high-powered offense, which ranks second nationally with 50.1 points per game, and he has also developed chemistry with electric receiver Josh Doctson. But the second half of the year will determine the viability of Boykin’s Heisman candidacy. The Horned Frogs still must face Oklahoma State, Oklahoma and Baylor in Big 12 play. If Boykin shines against those big-time opponents, he’ll be hard to beat for the Heisman. Most Pac-12 fans expected McCaffrey to emerge as an integral part of Stanford’s offense in 2015, but few probably envisioned this kind of first half to the season from the second-year running back. Through six games McCaffrey ranks second in the league to Oregon’s Royce Freeman in total rushing yards (844) and rushing yards per game (140.7) and has helped turn Stanford into a Pac-12 contender. ​McCaffrey became a national name after a stellar performance last Thursday night. In the Cardinal’s 56-35 upset of UCLA, the sophomore ran for a school-record 243 yards and scored four touchdowns. His rushing mark surpassed a 223-yard outing in 2009 from former Stanford back Toby Gerhart, who went on to become a Heisman finalist. But McCaffrey also added 122 kick return yards and four reception yards to set another school record with 369 all-purpose yards. We likely haven’t seen the last of McCaffrey, either. Stanford faces a very manageable schedule between now and its season-ending matchup with Notre Dame. That means the Cardinal should remain in prime position for a spot in the Pac-12 title game. If McCaffrey’s squad ends the year as a playoff contender, it’ll strengthen his case for the Heisman. Johnson is a case study in unfulfilled preseason hype. The highly touted junior entered the year poised to take over Gus Malzahn’s offense after two seasons of waiting behind Nick Marshall. Johnson had showed immense potential in short spurts during his early career on the Plains, but ultimately the comparisons to Cam Newton proved unwarranted. Johnson hasn’t taken a snap since Auburn’s 45-21 loss at LSU on Sept. 19. That’s because Malzahn benched his new starter after three games in favor of redshirt freshman Sean White. In Johnson’s first three contests he threw only five touchdowns against six picks. Two of those turnovers came against FCS foe Jacksonville State, which took the Tigers to overtime in Week Two. Right now it’s unclear when and if Johnson will see the field again. 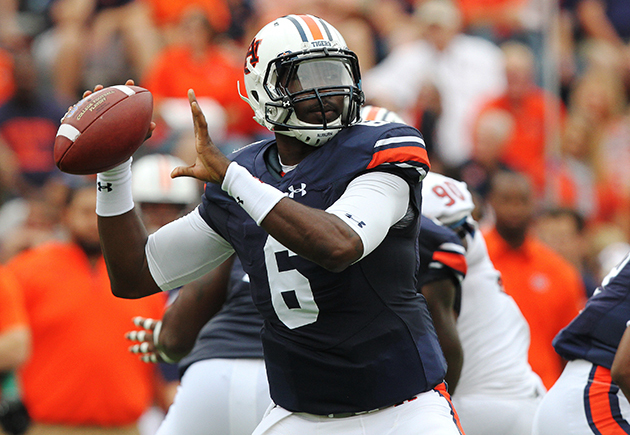 Auburn’s failure to meet preseason expectations isn’t entirely Johnson’s fault. The Tigers’ defense has not improved under defensive coordinator Will Muschamp. But Johnson entered the year with Heisman hype partly because Auburn’s own coaches touted the junior’s abilities during the off-season. Through seven weeks of football, that potential has gone unrealized. Players from smaller schools rarely get much love in the Heisman race. The last winner to hail from a non-traditional power program was BYU quarterback Ty Detmer in 1990. Since then, no school from outside the current Power Five membership has won a Heisman Trophy. But if one “mid-major” player deserves some recognition, it’s Memphis quarterback Paxton Lynch. On Saturday the 6-foot-7 junior threw for 384 yards and three touchdowns as the Tigers upset No. 13 Ole Miss 37-24. Lynch is currently the American Athletic Conference leader in passing efficiency (13 touchdowns vs. one interception) and is the headliner for an unbeaten Memphis squad that could reach a New Year’s Six bowl. Lynch’s candidacy remains a long shot, though perhaps he’ll deserve more attention if the Tigers remain undefeated. Mayfield struggled in Oklahoma’s loss to Texas in the Red River Rivalry, but he bounced back last week, recording 315 yards of offense and five touchdowns in a 55-0 rout of Kansas State in the Little Apple. Mayfield is easy to forget in a Big 12 that also features Boykin and Baylor quarterback Seth Russell, but if the Sooners emerge as conference champions, Mayfield will likely reach New York. ​Fournette isn’t the only SEC running back bulldozing opponents. On Saturday Alabama’s Derrick Henry rushed for a career-best 236 yards and two touchdowns in a 41-23 win at Texas A&M. Now Henry trails only Fournette among SEC rushers in touchdowns (12) and per-game rushing average (128.7). Alabama might be the most dangerous team in the SEC, which can only help Henry’s Heisman candidacy. Cook is emerging as Florida State’s most important player. He’s rushed for 385 yards and four touchdowns in the ‘Noles’ last two wins against Miami and Louisville. Cook also carries a higher per-carry average (8.68) than Fournette, though with four fewer rushing touchdowns. Keep an eye on the sophomore when Florida State travels to face No. 6 Clemson on Nov. 7.